I made this slaw to go atop some grilled fish tacos (to be posted later) and it was a hit with the family. Aside from being good, it really doesn't get much simpler than this. Despite the name, this would be welcome in almost any situation where you'd serve coleslaw. Combine all of the dressing ingredients in a small mixing bowl with tall sides, or a large tumbler cup/glass. Blend the ingredients well with a stick blender, then set aside. 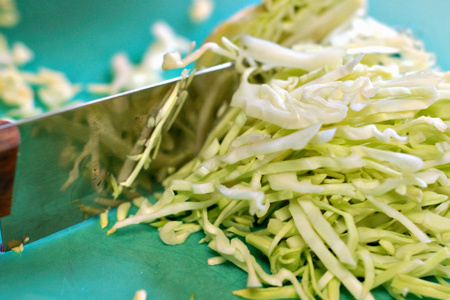 Slice the green cabbage thin (just under 1/4") and put it in a large mixing bowl. You need about three cups. Slice the red cabbage just like the green and add it to the mixing bowl. You need about 1 1/2 cups. Add the sliced onion, cilantro, and the dressing to the bowl. Stir all of the ingredients well. Serve along side/on top of your food of choice and enjoy! Looks like the perfect pairing with fish tacos. Thanks for the new coleslaw variation. Polwig - Actually, the slaw isn't spicy at all. It's just flavorful with a hint of smoky and earthy goodness. 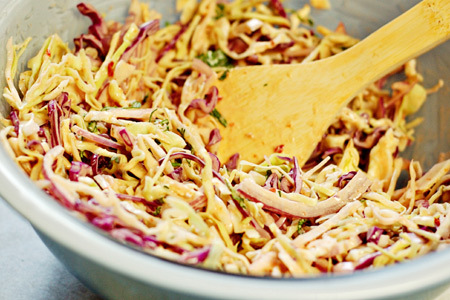 I love the flavors in this slaw, John! I saved it for future use because this would be PERFECT as a side dish for fajitas or like you said, even when regular slaw would be used. Thanks for sharing this one. Is that knife one of the inexpensive ones you got? How are they holding up? Looks like they are doing good. Chris - Yep, that's a Kiwi knife. I was going to use my mandoline, but those knives are killer for precise work. I've been searching for a slaw that would compliment Mexican food...thanks! Great! Even the 'non slaw' people thought it was great! I just bought some chipotle peppers in adobe...will go back for some cabbage...and I'm making this to go with my Pioneer Woman's tequila-lime chicken & ranch beans! Thx for the recipe! ok-- It IS spicy. I think it's going to be a hit with my husband, but not sure my kids are going to be too fond it!! I just wanted to drop in and say that I've made these twice now and they are RIDICULOUSLY good! Blows my sister-in-law's fish tacos out of the water. Thanks!